What has a planetarium, speaker, message decoder and more? This extraordinary pop-up book. This paper was supposed to be turned into a regular book, but it had its own radical ambitions. 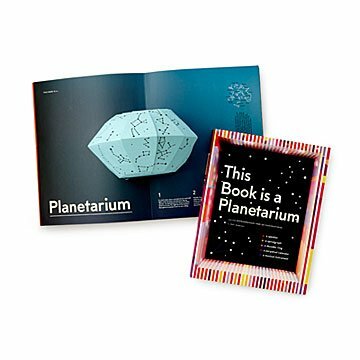 A one-of-a-kind gift for kids with vigorous imaginations (all kids? ), the pop-up design converts into six fully functional tools: A working planetarium that projects the constellations, a musical instrument complete with strings for strumming, a geometric drawing generator, an infinite calendar, a message decoder, and a sound amplifying speaker. Each feature is accompanied by fascinating text for an interactive experience that’s both educational and extraordinary. Printed in China. It was fun to see how excited she could get and that there's is so much to do with it! Great fit for the one that is hard to shop for! Not sure which question is going as comments, so here's more. I bought this as a gift for my goddaughter's 7th birthday. It came in plastic wrap to keep the very intricate and beautiful pop-ups inside the book safe during the shipping process. I opened it before giving it to her, to make sure it was with giving. I love the pages and the experiments, the detailed descriptions and the explanations. The pictures here do not do it justice. This is definitely a book that can be read and played with and learned from again and again. I am now buying 3 more as Christmas gifts for nieces and nephews and considering buying one for my open home.